Lake Shenandoah is a 36 acre impoundment owned by the Department of Game and Inland Fisheries. 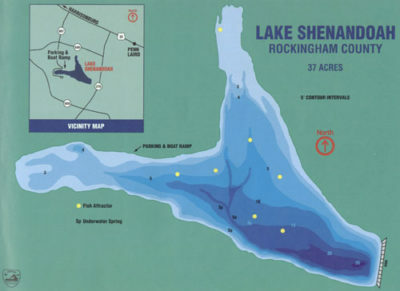 The lake is located in Rockingham County near the City of Harrisonburg. Urban development surrounds much of the lake. Much of the lake is shallow (less than 3 feet) and the maximum depth near the dam is 25 feet. Excessive nutrients entering the lake keep the water green with algal blooms through most of the year. Anglers have the opportunity to catch largemouth bass, bluegill, crappie, common carp, channel catfish and musky from Lake Shenandoah. Throughout its history Lake Shenandoah has had chronic fisheries problems that can be attributed directly to development in the drainage. A public golf course and expanding residential housing have introduced excessive nutrients and sediments to Lake Shenandoah. The result has been severe negative impacts on fish habitat. Excessive nutrients cause profound algal blooms which alter water quality. Decaying planktonik algae causes all the water in the lake except the upper few feet below the surface to become void of dissolved oxygen during the summer months. Low oxygen levels can suppress aquatic insect populations and stress fish . In addition, shallow water in the upper two arms of the lake with freshly deposited sediments creates poor physical habitat for all fish species. Compounding the problem, prey fish can avoid predators in this shallow water and become overpopulated and “stunted”. The overpopulated bluegill and crappie compete with young bass and catfish for the limited food supply causing poor growth for all fish species. 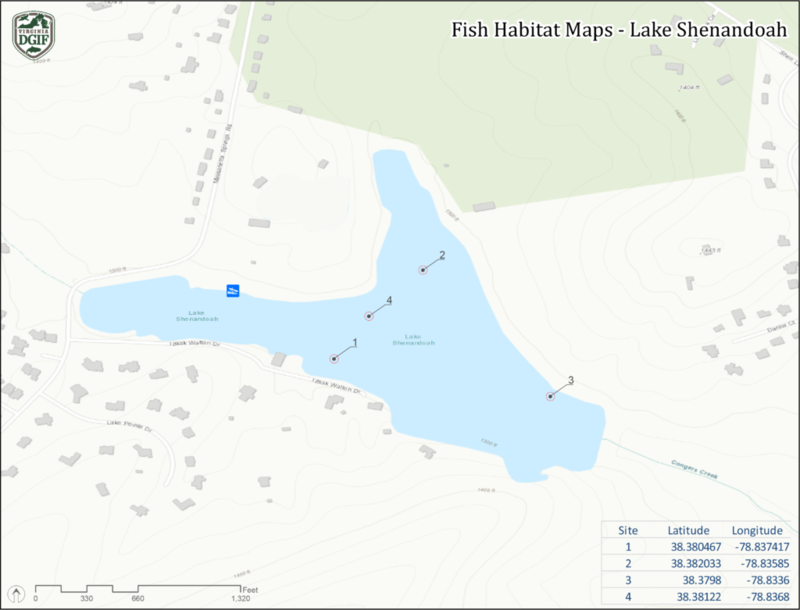 Currently, biologists are looking into ways to renovate Lake Shenandoah creating suitable habitat for a healthy fish population. Lake Shenandoah lies a few miles east of Harrisonburg in Rockingham County. To get to the lake, take Rt. 33 east out of Harrisonburg, then go south on Rt. 687 to the lake. “Fair” with a good size distribution best describes the largemouth bass population of Lake Shenandoah. In the 1970’s and 1980’s the bass population consisted mainly of fish less than 12 inches in length. The 18 inch minimum-size regulation put into effect in 1989 has worked to restructure the bass population. Largemouth can be found in modest numbers, with fish 9-15″ making up the bulk of the fishery. Black crappie in Lake Shenandoah are severely “stunted”. Few fish over 6″ have been sampled by biologists in recent years. Until the lake can be renovated the crappie population will probably remain unchanged. Bluegill in Lake Shenandoah are also moderately “stunted” Few fish over 6″ have been collected by biologist in recent years. However, the lake does harbor good numbers of bluegill. Without habitat improvement, the bluegill population will probably remain unchanged. The Department annually stocks channel catfish fingerlings in the lake. Some channel catfish are also reproducing naturally. Biologists have had a difficult time collecting catfish from the lake. Lake renovation would also benefit the catfish population. Anglers that fish after dark at Lake Shenandoah have recently reported some good catches of catfish. The one bright spot at Lake Shenandoah is the musky fishery. Musky do not naturally reproduce in Lake Shenandoah therefore the Department must stock fingerlings each year. Biologists have sampled musky up to 20 lbs from the lake in recent years. Remember, musky are top predators on the food chain and are never found in large numbers. However, Lake Shenandoah offers anglers a great opportunity to catch a musky. Musky are a “cool-water” fish and are active even during the winter months. Musky are caught from the lake every of the year. Due to the lake’s murky water, anglers should use baits that have a lot of “action”. Only one bass over 18 inches total length may be harvested per day. All bass less than 18 inches long must be release. There is a 40 inch minimum size limit on musky in Lake Shenandoah. Anglers can only harvest musky greater than 40 inches. Anglers can harvest 1 musky per day. Gasoline motors, swimming, wading, ice skating, hunting, trapping, camping, organized fishing tournaments, and alcoholic beverages are prohibited. Fishing is permitted from 1 hour before sunrise to 1 hour after sunset. All other activities shall be conducted only during daylight hours. Fishing regulations shall conform to general statewide regulations unless otherwise posted. Lake Shenandoah has a large gravel parking lot and a paved boat ramp w/ courtesy dock. Almost the entire perimeter of the lake is accessible for shoreline angling. There are no concessions available at Lake Shenandoah.